Facebook's 10-year challenge: Fun and games, or something more? 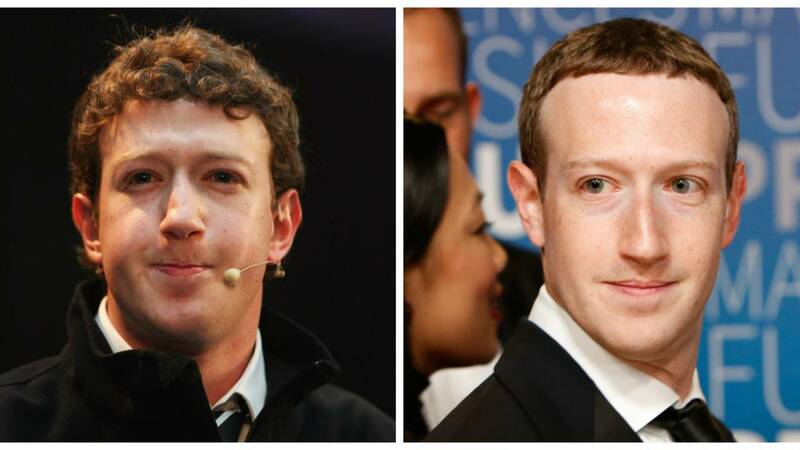 Facebook CEO Mark Zuckerberg -- on the left is a photo from 2009, and at right, Zuckerberg is shown in late 2018. (This was not posted by him as a 10-year challenge). Both photos copyright Getty Images. It was just a “flippant tweet,” admitted Kate O’Neill, who posted it Saturday and then authored the opinion piece in Wired, which ran Tuesday. O’Neill, for reference, lists herself on Twitter as an author and a keynote speaker, among a few other short descriptors. But she seems to really know her stuff, and we're interested in this theory she presents about facial recognition algorithms. Let’s back up: The Facebook meme, or challenge, to which we’re referring has several versions, but the gist of it involves people posting their very first profile picture alongside their current profile photo -- or on the flip side, if their first-ever photo isn't available (which seems to be the case if you had Facebook in the early days, like in 2004-05), then you're just supposed to use an image from 10 years ago and compare it to today's. Make sense? That "flippant tweet" has now now gone viral, so we're not the only ones whose curiousity was piqued. But really -- and there’s no official answer to this next question, so maybe ponder it later today, or take a minute to gather your thoughts on the matter: Do you carefully consider what you share on social media? One social media expert we spoke with for another story on these types of sites -- her name is Nicole Hudson, the founder and president of Inbound Lead Solutions, which has offices in Metro Detroit -- said that apps and sites aren’t always as private as you might think. It’s easy to be seduced into a false sense of security. It helps to consider these “rented channels,” Hudson said. Think of it like this, she said: There’s nothing in a social media channel or an app that you own. Not your pictures, not your data or chats; none of it. All of those things are accessible. That's good to keep in mind, and it seems relevent, considering this theory. Getting back to O’Neill, she said some people have been critical of her idea, many saying that the Facebook pictures at issue were already available. “The most common rebuttal was: ‘That data is already available. Facebook's already got all the profile pictures,’” she said. To which O’Neill countered, yes, of course. You could dig through Facebook and pour through photos, dates and other data -- but you’re going to get a lot of “useless noise,” O’Neill said. Pictures aren’t always posted in order by date, for example, and sometimes, people don’t even use their own images as profile photos. You might use your child, car or pet instead. “In other words, thanks to this meme, there’s now a very large data set of carefully curated photos of people from roughly 10 years ago and now,” O’Neill writes. In the op-ed, O'Neill also touches on last year’s privacy scandal involving Cambridge Analytica, in which tens of millions of Americans’ information was shared without their explicit permission. It all factors into the equation. But getting back to the main point: It’s not even necessarily a bad thing that someone could use your Facebook photos to train a facial recognition algorithm, O’Neill said. “In a way, it’s inevitable,” she wrote. It sounds as if it’s just one more thing to be mindful of. The author brought up yet another good point: maybe all of this could help authorities find missing children, as in, especially ones who’ve been gone for a long period of time, perhaps who’ve grown up. If they’re alive, that means they’ll have aged, so this type of study might give investigators a better indication of what those missing people might look like now. And hey, for what it’s worth, we’re not saying O’Neill is right or wrong on any of this. Is there an answer, really? We think she's raising some excellent questions. So tell us: Did you participate in the challenge? Do you ever give it some thought before you jump in on the latest social media craze or trending "challenge?"